Izzy’s is one of the places I like in the Twin Cities that I actually didn’t go to very much when I lived there, simply because Izzy’s was getting started right about the time I was finishing up in Minnesota; Izzy’s opened in July of 2000, less than a year before we packed up and left for New England. But before we moved east, we had discovered their pleasant shop on Marshall Ave just east of Cleveland (right next to the location that used to hold Legacy Chocolates, my very first review on this site, but sadly, Legacy’s St Paul store closed years ago), and had several pleasant visits there. There are two things that really stick out about Izzy’s to me. The first is the quality of the ice cream. Every batch of ice cream I’ve had there was smooth, silky, and flavorful, without any greasy mouthfeel or heaviness. Combine that with some flavors that are interesting (but generally not outlandish, no kielbasa or “tiny threads o’ tungsten” ice cream flavors here), like some of my personal favorites: salty caramel, chai, or Summit Oatmeal Stout (featuring the beer of local favorite Summit Brewing), and it’s quite a nice place to come grab a scoop. 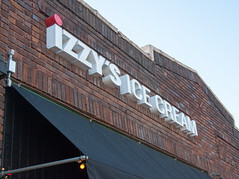 The second is one of their funky marketing tricks: the “Izzy Scoop”. A diminutive little 3/4 oz scoop of ice cream, any regular single or double scoop of ice cream comes with a complementary “Izzy Scoop”: a small extra scoop of another flavor. It’s their way of giving you a little something extra, and the customer’s way of trying out another flavor as well. And it also lends itself to my technique of trying out a lot of flavors… and they even have a special that encourages exactly that: the “Dizzy Izzy”. Five small Izzy Scoops of ice cream served up in a dish or a cone, it’s a great way to try out a lot of flavors. Indeed, looking over photos, I think it’s been almost a decade since I’ve gotten anything other than the Dizzy Izzy. And this time was no different, choosing for myself a dish with malted caramel, chai, chocolate almond, Summit Oatmeal Stout, and the Salted Caramel. As I mentioned before, the last of these are amongst my most favorite ice creams ever; the Salted Caramel is rich, caramely, and just salty enough to give it some good mouthfeel. The Summit Oatmeal Stout is a great ice cream version of it’s namesake: with rich malty flavors and a light hops note. 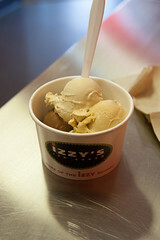 Overall, Izzy’s is a pleasant ice cream shop, with some good flavors, excellent ice cream, and they offer up a great way to sample their flavors. That’s why it remains a stop on every trip of mine to the Twin Cities.